A survey by QuickBridge, a privately-held, leading financial services firm offering small business loans to businesses nationwide, states that 83 percent of small business owners expect their business sales to increase over the next year. 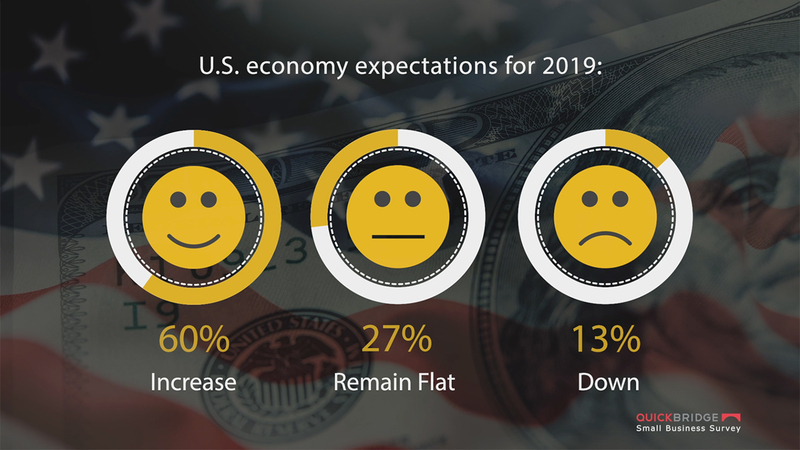 The Q4 survey data assessed small business owners' expectations for business growth and the U.S. economy in 2019. Also highlighted was praise for online lenders: 54 percent of respondents believe online lenders make it fairly easy to secure funding when compared to traditional lenders, with 22 percent stating very easy, and 24 percent difficult. Expansion was cited as a key reason for seeking financing. IRVINE, Calif.--(BUSINESS WIRE)--A survey by QuickBridge, a privately-held, leading financial services firm offering small business loans to businesses nationwide, states 83 percent of business owners expect their business sales to increase over the next year. The Q4 survey data assessed small business owners’ expectations for business growth and the U.S. economy in 2019. Optimism is high: 83 percent of respondents are confident in an increase in sales, with 15 percent predicting they’ll remain flat, and 2 percent down. New tax laws received mixed reviews: 49 percent of respondents expect no impact, with 35 percent predicting their tax burden will be reduced, and 16 percent expect their taxes to increase. Challenges remain: 33 percent of respondents believe that securing capital will be their biggest challenge, with growth, increasing profits, and hiring employees averaging 20 percent each. Praise for online lenders: 54 percent of respondents think online lenders make it fairly easy to secure funding when compared to traditional lenders, with 22 percent stating very easy, and 24 percent difficult. Expansion cited as main reason for seeking financing: 28 percent of respondents plan to use funding for expansion, with equipment acquisition and consolidating/paying off bills each coming in at approximately 21 percent. Download the complimentary New Year Business Tips white paper at: https://quickbridge.com/blog/5-essential-small-business-new-year-tips/. Founded in 2011, Quick Bridge Funding LLC (stylized as QuickBridge) is a privately-held financial services firm headquartered in Irvine, California with a satellite office in New York City. QuickBridge provides short-term working capital loans to small to mid-sized businesses nationwide. Since its founding, QuickBridge has provided more than $600 million in working capital to more than 10,000 businesses. QuickBridge ranked two consecutive years on the Inc.500 list and is a previous Business Intelligence Group and Equipment Leasing and Finance Association (ELFA) award winner. Visit quickbridge.com. QuickBridge survey shows small business owners are confident about their future growth prospects.